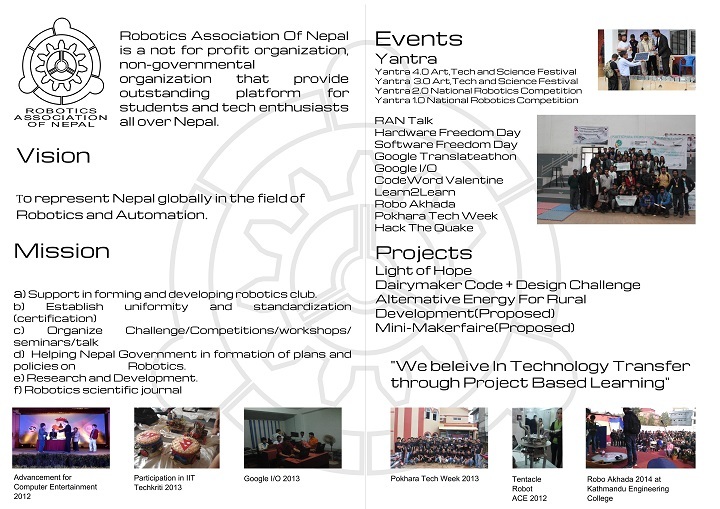 Robotics Association of Nepal (RAN) is the only national-level non-profit association that provides an outstanding platform for students and enthusiasts all over Nepal. RAN is established to promote, educate, explore, and compete in the field of robotics. Our mission is to create platforms, partnerships and possibilities to enable Nepali organizations and individuals to understand the implications of science of mechanics, electronics, robotics and coding and implement them to find solutions to everyday life problems. Our objective is to provide a problem based learning environment where youths can explore solutions to automate and mechanize everyday processes and build effective and efficient systems that leads to better and dignified lives. RAN has team of 11 executive members, 10 RAN representative from schools and 51 RAN members from engineering colleges. There are five chief post as: President, Vice-president, Secretary, Joint Secretary, Treasurer and Research and Development Head. RAN current organization team size: 51 members all over the Nepal, 15 paid staff, 4 intern. Formation of Robotics Association Of Nepal was initiation taken from the final year undergraduate students from Kathford International college of Engineering and Management, Kathmandu Engineering College, Himalayan College of Engineering, Advanced College of Engineering and Management, Himalayan Institute of Science and Management, Kantipur City College along with other engineering colleges of various universities felt necessary of central hub for exploring, learning, promoting and sharing robotics knowledge to represent Nepal globally in 2009 through the help of technological innovations for skills development. After six months of preparation, constitution was finalized and Robotics Association of Nepal was registered as not for Profit organization in 2010. Since then we have been continuously code + hardware skills development of youngsters. So far 4000 students have already received trainings on robotics and automation. We initiated Yantra as National Robotics competition which is now Art,tech and science festival. As post earthquake campaign, we were able to trained 20 engineering students on solar technical and business aspect also enabling their training skills through local training for the youngsters/villagers in Nuwakot. We distributed more than 300 pieces of solar stations to the earthquake affected peoples in collaboration of National and international organization. Robotics Association of Nepal (RAN) celebrates festival of art, science and technology “Yantra”- an annual showcase and platform for all the enthusiasts in field of art, tech and science. Yantra was initiated by Robotics Association of Nepal in 2012 as a national robotics competition, whose winner were sent to International Robotics Competition in India Institute of Technology. Now we have opened this platform for collaboration among artists and engineers.We have successfully conducted 5 versions of Yantra till now. This year, we are going to organize Yantra 5.0- which will include International Robotics Competition. A money exchange board giving information about Forex exchange. Some of the significant features being- digitized display, wireless control over the board and convenient rate update through mobile device manually. Addition to these features the board can be updated with latest rate, extracting the latest rate from website and transferring the data from android device via Bluetooth connection. So called internet of things concept is used in this system. The system consists of temperature and humidity sensors, that continuously monitor the temperature of the server system. Recording the time variant data in online database and presenting the data in Graphical format-plotting the graph against time. The database record can be accessed online for regular checkup and monitoring, and required action can be taken if any fault condition is indicated by the sensed data. A campaign launched to provide technical aid to 2015 earthquake victims in Nepal. In this campaign we distributed solar systems to the locals and institutes of affected regions. For the distribution, we had built a system of our own that contained a solar panel that charges a battery through a charge controller. The battery backup was then used to light bulbs or charge mobile phones. Hacking our way, we are making a Computer Numeric Controlled(CNC) plasma cutter, out of a normally manually controlled plasma cutter. This so called CNC plasma cutter, is a plasma cutter automated using computer instruction set, which can be used to cut the metal sheets in desired shapes. When women works together hand in hand they can change the world. Robotics Association Of Nepal brings this concept into implementation by forming a team “Miss-Tech”. It has been initiated with a vision of encouraging women in technical field. It is a team of “women for women”.We are developing a platform for enthusiastic women in technology to share their technical knowledge so that they can make a difference in their communities. We provide different software and hardware related workshops for the students of different levels to teach courses related to coding, creating and computing. Each year we celebrate mi believe that the fastest way to change the society is to mobilize the women of the society. Comparatively a new topic for us, we are starting this expedition with a goal to build an interactive robot- that can recognize human through image processing and communicate with human using speech recognition and speech processing. Based on whether a person is known or unknown, the robot can interact with them; for which we use the reference of image processing data and the stored data in database. Then it can communicate back to them accordingly. This is our proposed framework for the particular topic. We are optimistic on reaching the goal at least and possibly we could integrate some advance technology to facilitate this AI robot. An automated wheel chair targeted for differently able people. In looks it is similar, to normal wheel chairs used. The difference lies in the addition of power motor in the wheels allowing the wheel chair to be driven on battery power rather than to be driven with manually force. Also for driving and controlling the chair, it is provided with mounted joystick and can even be controlled using android devices. Working with the phantom 2 vision plus, shared to RAN by Nepal Communitere, we are studying its construction, working mechanism and video streaming feature. Doing research on all these attributes, we are working to come up with something similar of our own with some other integrated features that can be a boon in fields such as medicine, research, cinematography and so on. In this process we have already build our own remote controlled quad, RC planes and are trying to initiate activities in field on drone (automated quad) for medical transportation. Collaboration between RAN and Communitere, we are collectively working with 3D printer- RAN operating the printer while Communitere providing all the resources required including the printer itself. The 3D printer from cube is medium scale printer furnished for commercial use that prints any real life objects on the basis of the 3D design of that particular object provided. For this particular printer, default ink is the used, PLA- a bio-degradable plastic material that has gained popularity with 3D printing for the very reason. Using this printer, we are trying to work on printing prosthetic parts for differently abled people. Also we are working out in building a 3D printer of our own, similar to an open source 3D printer RepRap pro. The framework for this printer is proposed to be printed from the cube 3D printer on operation. Besides various research activities and technical events we also provide technical assistance. One of our main mission- encouraging enthusiasts in technical field, transferring the technical knowledge and updating the students with latest technology is what we can’t leave behind. For this particular purpose, we have been launching workshops and seminars since the establishment of the organization. It is one of the vital parts of RAN activities. For transferring the technical knowledge and latest updates on technology on more frequent basis, we are hence launching weekly workshops centralized on technology and robotics. In these session will be teaching them how to build a basic robot and modify it adding various sensors and controller boards-specifically arduino, AVR and Raspberry Pi. After the massive earthquake on April, 2015 Robotics Association of Nepal distributed more than 350 Solar system to seven different earthquake affected districts Sindhupalchowk, Gorkha, Nuwakot, Rasuwa, Dhading, Kavre, and Dolakha which sparked the humanitarian efforts from RAN. RAN has been working with different organization for post disaster works. Nepal Communitere has been the closed partner for RAN’s humanitarian effort. Just two months ago, RAN co-organized Kathmandu Mini Maker faire as first ever humanitarian makerfaire in the world engaging community makers to solve problems caused due to disaster as the part of disaster response. Early Warning system for Predictable disaster is another work done for disaster response in collaboration with Nepal Innovation Lab, World Vision. Being a Robotics Organization, Building robot is the thing that we never exclude. In the course of time, we have been building “Automatic Akhada Robot”, an automatic robot that, when detects any objects in its vicinity, tries to tackle the object. Also the robot will have attribute that intends the robot to avoid certain colored zone, and remain in other color zone. Other one being “maze solving robot”- a robot that can do maze solving, Line tracking, and can operate in either automatic or manual mode. Automatic mode being as predefined, maze solving and line tracking. In manual mode, the robot can be controlled wirelessly from handheld android devices. “Basic switch controlled robot”- a robot containing a usual robotic stuffs-motors, wheels, chasis, switches and remote. This is one of the basic robot that we believe, is one of the simplest way to teach robot making and electrical stuffs in robotics to beginner level students. Though all these robot making stuffs in this topic are solely for teaching learning process and implementation in Robotics competitions, we are planning to come up with robots that can be implemented in real life problems.